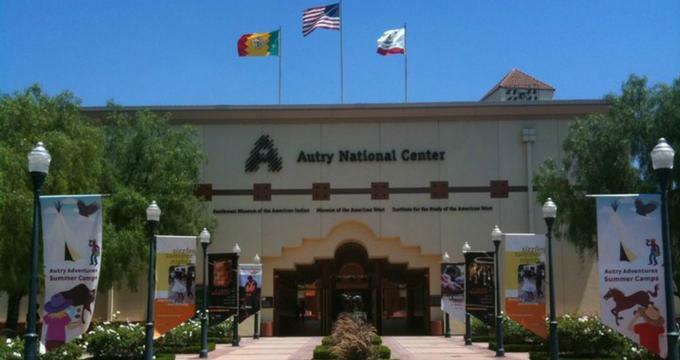 The Autry Museum uses modern methods to retell American history, working to dismantle the myths and stereotypes of the culture of the Old West that is ingrained into modern society. With a newer and modern-day multifaceted approach, the gallery exhibits multicultural collections pertaining to the history of the American West. The museum holds themed events aimed at collecting and disseminating information and artifacts of the era to provide a fresh and unbridled view of that time. At the Autry Museum of the American West, exhibits focus in particular on the accomplishments of the women of the time. Most of the items exhibited were used by women to provide food for their families, such as bowls, jars, fiber baskets, wool blankets, awls, and hide scrapers, portraying women's great contribution to the making of the West’s regional ethnic culture. The museum is famous for its Masters of the American West exhibition, which hosted some of the best visual works of art, featuring paintings and sculptures from 76 renowned artists. Other famous exhibitions held in the museum includeEmpire and Liberty, showcasing the Civil War and the West, Kim String fellowsJackrabbit Homestead in 2015, Route 66:The Road and the Romance, and Floral Journey,show casing native North American bead work. All of the artwork from previous exhibitions is available in the archives for sale. Look out for the next themed exhibition,Play. There are also several ongoing exhibitions titledCalifornia Continued, Art of the West, and Cowboy Gallery, to name just a few. This is the biggest exhibition project held in the Autry Museum for nearly 30 years. It depicts the traditional way of caring for the environment, along with an extraordinary collection of arts, artifacts, and a Native American collection that is exhibited for the first time. The display shows how the natives of California used the plants and water over the generations. The exhibition also features The Life and Work of Mabel McKay, which tells the life story of the well-known healer and basket weaver,showing how a modern figure continued to maintain traditional ways. Art of the West is a modern method of showcasing cultural practices of the people who shaped the American West. The materials exhibit the three primary themes of religion, ritual land, and the landscape. This also includes some beautiful collections from the Southwest Museum. Discover the chuck wagon and other cowboy tools and take a journey of evolution from the historical cowboys to their modern-day equivalents. The display shows the trails along the ranches and plains that were iconic to the American West. Pique your interest with the great cultural fusions as well as the determination to conquer the environment, from times past to the American cowboys of today. While at the Autry, look out for exciting and new or upcoming exhibitions. Be ready to learn from the enriching collections and lose yourself in the history of America's Wild West. Autry is also a great facility for researchers. Museum hours are Tuesday to Friday from 10:00amto 4:00pm, Saturday and Sundays from 10:00am to 5:00pm. Guided tours are available on weekends from 11:00amto 3:00pm. The admission fees range from $6 to $14 with free days available on every second Tuesday of the month.